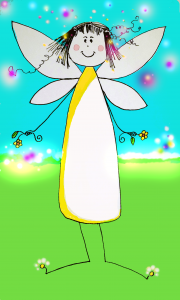 Can you imagine how light a Pollen-Fairy is? On a dark windy night Squirt is sent tumbling down the street and up into the sky. The moonlight offers tiny Squirt hope. “Make a wish, little Squirt. You must believe that no matter where you land, I’m sure you’ll find a friend that will offer you a hand…”, says the moon. All Squirt wishes for is to find a new house, but she finds more. Squirt finds a new home in Natasha’s Wood. A great big maple leaf, as big as a dish, catches Squirt and gently lowers her to the ground. Here in this beautiful secret garden, Squirt finds other magical friends – fairies, dragons and a unicorn – that are full of love and magic, just like Squirt! Open until September 1, 2019 (final posting date Aug 3, 2019). Parents/Guardians, as soon as you have submitted the artwork via the online entry form, please mail/courier the ORIGINAL artwork to the address at the bottom of this page. The Natasha’s Wood Foundation 2017-2019 Ongoing Youth Art Campaign is administered by Natasha’s Wood Foundation. The Campaign is open to all legal residents of Canada (excluding the Province of Quebec) who are aged between 5 and 18 years of age (inclusively) by or on September 1, 2019. No purchase necessary. There are a minimum of 40 prizes available to be won. The odds of winning the prize will depend upon the total number of eligible entries received. Participation in the contest is subject to compliance with the Official Rules.